Pull up diapers are renowned for being a landmark milestone in every child's life. It’s a sign your little bundle of joy is growing up and is starting to take control of their own lives. Potty training has been taken to the next level, and it means, as mom and dad, you’ve got one less job to do. Although it’s still a diaper, a pull-up diaper is the famous step towards independence, which at this stage of their life, is one you’ll be glad to see. To give your child the best start in this crucial part of their lives, you need the best pull-up diapers that will allow everyone to have the best experience possible. To give you everything you need to ensure that you’re buying the best product for you and your child, I’ve compiled a list of some of my favorite pull-up diapers that are available on the market, ensuring you make the right decision first time round. To start my list, I’ve chosen a leading brand in the diaper industry that has become a household name in countries around the world. Pampers is renowned for their quality and outstanding levels of functionality which is clear in this product, specifically designed for your daughter. With these diapers, you’ll enjoy the incredible benefits of a 360° stretchy waistband, ensuring that this one-size-fits-all diaper is comfortable for your child, no matter how fast they grow. This unique and innovative design means your child can easily pull down and pull up their diapers as they need to. Inside the diaper, you’ll discover Pampers exclusive and patented Extra Absorb Channel technology, making these diapers one of the most absorbent diapers on the market, ideal for days and nights. They also boast LeakGuard barrier technology, helping everything stay inside the diaper while your child roams around freely. What's Great About It: These diapers are made using ultra-soft cotton like materials, guaranteeing maximum levels of comfort for your child every single day. What’s more, this material contains Easy-Tear sides, ensuring your child can quickly learn how to put on and take off the diapers, teaching them the value of independence. Similar to the Pampers product above yet designed graphically and visually so your boys will be happy to use them every single day. 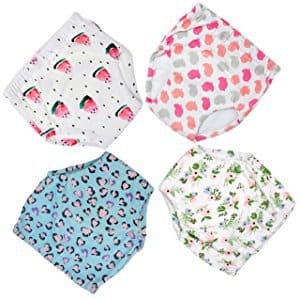 As with the girl’s edition above, these diapers are available in nine unique and varying sizes and contain a 360° stretchy waistband, making them ideal for the maximum levels of comfort your child can enjoy while using the diapers. Furthermore, they also boast the same easy-tear sides for quick and time-efficient removal. Inside the diapers, these diapers contain the same incredible level of protection thanks to the innovative and market-leading Extra Absorb Channels that helps to soak and hold any leakages inside the nappy, keeping your child happy, safe and dry throughout the days and the nights. The diapers are designed using high-quality cotton-like materials and pride themselves on their LeakGuard Barriers that helps to keep everything inside the diaper. What's Great About It: To ensure that your child wants to use the diapers, each diaper and the packaging comes with a unique graphical design that they’ll love to put on. For the boys, these visuals include little trains, speedometers and famous television characters that they’ll simply adore. These diapers are available in both medium and large sizes that enable you to find and purchase the perfect fit for your child, awarding with maximum levels of comfort that always result in happy babies and parents. Meticulously tested for their effectiveness, these diapers are capable of holding up to 30ml of urine without changing, enabling your child to enjoy their days to the fullest potential, without having to worry about being wet and uncomfortable. This is all thanks to the triple integrated layers. Thanks to the unique design of these diaper-pants, this high-quality product is incredibly easy to use, meaning your child can learn the essential values of independence by pulling them up and down as they need to, perfect for potty training effectively in their own time. What’s more, you won’t have to continuously buy new diapers as these are perfectly capable of being thrown in the washing machine, meaning you’ll never have to worry about running out. What's Great About It: One of the hardest parts of potty training is getting your child to actually put the diapers on. This isn’t a problem when it comes to the Mom & Bab diapers thanks to the unique, vibrant and visually attractive diapers with fun graphics that will ensure that your child is happy to wear them. 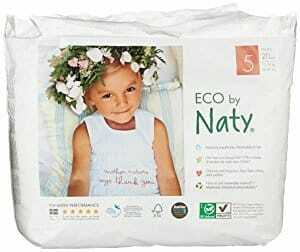 If you’re looking for the highest-quality pull-on diapers on the market that has your child’s well-being at the core of everything they do, there’s no need to look further than the Nature Babycare Diapers from Naty. A leader when it comes to high-quality, eco-friendly children’s products, there’s absolutely no oil-based plastics in these diapers, enabling you to be safe in the knowledge that your child’s gentle skin is fully protected. The diapers themselves are made from breathable fabric materials that provide an ultra-comfortable fit, no matter the size or weight of your toddler, making them the perfect choice of diaper, no matter what stage of potty training your child is currently at. This also means your child can roam about their daily business uninhibited. These diapers pride themselves on being chlorine-free, boasting natural materials for a fully natural layer of protection. What's Great About It: These eco-friendly diapers are available in a variety of different sizes and pack count sizes, meaning you can easily purchase the pack that best suits you and your family, enabling you to make the most cost-effective decision to suit you. 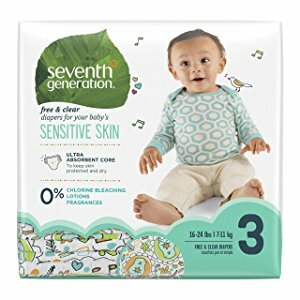 If you’re looking for outstanding protection and quality for your baby for a mid-range price, Seventh Generation may have the best product for you. These diapers are ultra-absorbent as well as capable of holding maximum contents, ensuring they are long-lasting while protecting your child. These diapers are made from ecologically friendly materials that are free from chlorine bleaches, so they take the best interests for your child’s sensitive skin into consideration. Thanks to these innovative materials, including the wood pulp core that’s sustainably sourced as well as being FSC certified, your child will also be able to benefit from bonus hypoallergenic properties. This makes these diapers perfect for toddlers with extra sensitive skin and allergies. Additionally, there are over 28 different sizes and pack bundles, ensuring you can make the perfect purchasing decision for your child. What's Great About It: The outstanding levels of care for your child’s well-being continues thanks to the complete absence of fluorides, fragrances, and other potentially harmful chemicals, making these diapers suitable for newborns, all the way until your child is ready to use the toilet on their own. To conclude my list, these 100% cotton pull-up diapers are the perfect set for teaching your child the essential levels of independence they need for later life. Easily one of the most absorbent diapers on my list, each of these contain over five layers of extra padding and high-level absorbent materials to ensure that these diapers are some of the best. Additionally, these extra layers found both at the front and the back maximize the level of comfort that your child gets, allowing them the freedom to move throughout their days uninhibited. The hole regions around the leg are specially designed by experts to minimize the risk of leaking and help to absorb any excess moisture, helping your child stay dry while it continues to add to the already high levels of movement that these diapers provide. What’s more, these diapers are highly-durable and can be cleaned out and thrown in the washing machine, making them perfect for multiple uses, saving you money in the long term. What's Great About It: As you can see, these diapers come in packs of four, each one with a unique and captivating design that your child is going to love. These help your child look great while they’re running around throughout their days while feeling enticed to wear their grown-up pants, teaching them to be independent. Now that you’re aware of some of the best products available on today’s market, it’s time to make that all-important decision of what’s best for you. 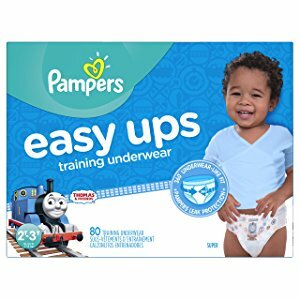 Scroll down to discover my step-by-step buying guide, showing you everything you need to know about pull up diapers so you can make the best buying decision possible. One of the most important aspects to consider when it comes to baby diapers is the comfort level that each diaper provides. If the diapers are uncomfortable, your child won’t want to wear them, which will always result in an unhappy child and an unhappy parent. To gauge the comfort level, look for the materials that the diapers are made of. You want to look for cotton materials that provide the highest level of comfort as well as extra padding where possible. As a rule of thumb, the cheaper the diapers, and the cheaper the materials, the more uncomfortable they are going to be. It’s always best to pay a little bit extra for a successful potty-training experience. During this stage of your child’s life, they are going to be growing quickly and therefore, once you find the diapers that suit you and your child, you won’t want to change that just because there are no sizes available. One of the key elements to successful potty-training is consistency, so always refer to what sizes are available before you purchase the ideal diapers for your child. Try to find a brand that has sizes that will suit your child for the time they will need them. One of the key lessons that your child will learn during the potty-training stage is independence. This includes notifying you or attempting to use the toilet themselves when they need to go. A pull-up diaper is simply a back-up for the times that they are not prepared. This means the diapers should be easy to pull up and down when they want while still providing protection in case they don't make it to the bathroom in time. One of the leading features when it comes to this is easy-tear sides, where your child can simply rip off the diapers without having to worry about fiddling around with little straps. If your child doesn’t get to the toilet in time, which will happen more times than not in the beginning, you’re going to need a diaper that will be able to hold the discharges. Always check your chosen product to ensure that it has high levels of absorbency so that it won’t matter. The more premium the product, the higher the absorbency rate and therefore the chosen diapers can be used as sleep diapers throughout the night. Some parents won’t want to keep paying out for new diapers every single week. One of the newest trends to come back into fashion with a ton of features is the machine washable diaper. This means you can simply clean out the diaper and throw them in the washing machine for multiple uses. These diapers are usually incredibly durable and can last years, saving you so much money in the long run. Taking your time to invest in the right pull-up diapers for your child during this essential learning time is crucial and it will make the difference between success and long-winded potty training. Use my step-by-step buying guide above, coupled with my list of favorites, to ensure you’re making the best decision possible, guaranteed to result in happy and independent toddlers.